When the weather is nice, outdoor seating at a restaurant, is prime real estate. A room with a view, to all the happenings of the city. What if I told you, that this prime real estate doesn’t have to cost you an arm and a leg. Do I have your attention? 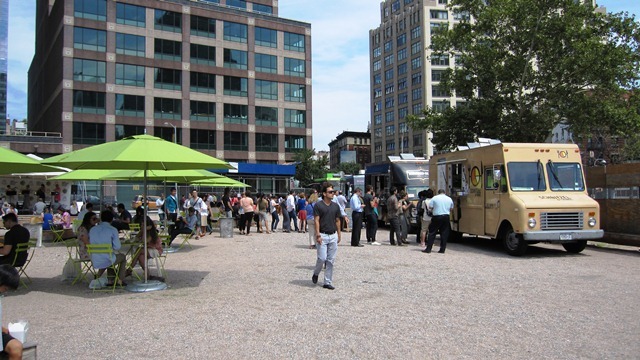 The New York City Food Truck Association, has teamed up with various real restate developers, including Trinity Real Estate, Rockrose Properties, Brookfield Properties and RXR Real Estate, to offer the residents and visitors of New York City, an opportunity to dine al fresco… ON THE CHEAP. Big deal you say? Let me explain. Cheapeats , had the opportunity to visit LMCC Lent Space Lot , which is located at 70 Varick Street. 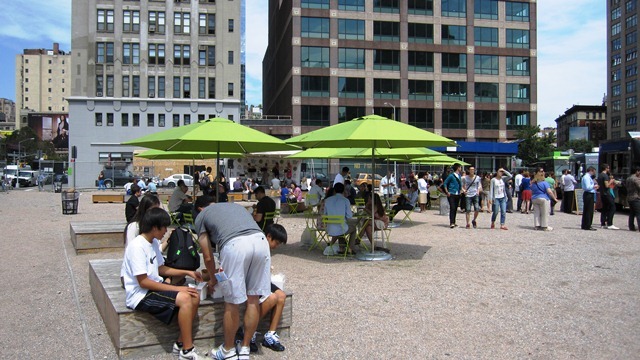 Lent Space, is a HUGE open lot, furnished with tables, chairs, benches, umbrellas and trees, provided by Hudson Square Connection. The Foodtrucks are nestled on one side of the lot, somewhere between 3 and 5. The rotation changes daily. We received the VIP tour, from Laci Texter, Community Manager for NYC Food Truck Association. Dumplings from Rickshaw , was the lunch of choice. So we carried our white take out boxes and grabbed a table in the center of the lot. As we chatted, I couldn’t help but notice, the sea of people strolling in from the neighboring office buildings. Everyone had smiles on their faces and were just enjoying being outside. On the north side of the lot, a small band was playing on music stage. Sunshine, food and FREE music? The music is courtesy of Lower Manhattan Cultural Council. Besides Lent Space, there are other food truck lots. World Financial Center is a haven for those working at the remote – World Financial Center. Nestled by the marina, are a line up of food trucks, feeding Wall Street and offering the best water views money can buy. A MUST TRY!! Starrett-Lehigh – located at 11th Avenue & W 26th Street, is a unique setting, because some of trucks are located on the 12th and 15th fl of the Starrett Lehigh Building. Long Island City – located at 43-29 Crescent Street, is a little kept secret. Well…..not anymore. I encourage you to visit any or all of these foodtruck lots. It will be the best $5 – $10 you will spend. This entry was posted by Rosemarie on Friday, September 7th, 2012 at 9:08 am	and is filed under Chelsea, Financial District, Food Trucks, Manhattan, Queens, Soho, Street Food. You can follow any responses to this entry through the RSS 2.0 feed. You can leave a response, or trackback from your own site.